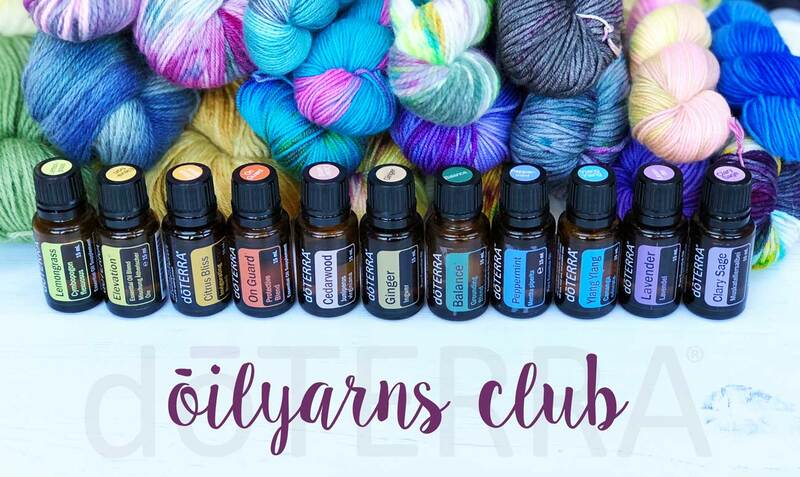 I came up for the idea for this club because I wanted to combine my two passions: yarns and dōTERRA essential oils, and find a way of sharing them with a wider audience. Although not essentially linked (excuse the pun), I think they will appeal to like minded people, hence Ōilyarns Club was born. With each delivery you will receive at least (but not limited to) one skein of yarn and at least one dōTERRA essential oil sample. Both focus on a theme – this might be an emotion, a season, a holiday or even a particular flower that blooms at that time of year. The colours of the yarn and the oils complement each other. (You can see November’s box here). The yarns vary each month and are all hand-dyed by me, it might be Surino, Cashino Aran, or 4ply , Velluto, Altopiano, or Di Lusso (I’ve just realised that most of my yarns end it ō !) There may also be some Queen Silk Lace or other silks in there too. They will be exclusive to the Ōilyarns Club and will not be available to buy in the shop. I may also include pattern suggestions or links to free patterns where available. I do encourage each subscriber to purchase an aromatherapy diffuser if you do not have one already. There is lots of choice on Amazon. The subscription costs £20 per package (+£3.50 postage please choose “via Ōilyarns” option), but you will be getting far more than that – the yarn alone will be worth between £15 and £25 and the ōils are worth considerably more than the balance. They are extremely potent and pure, and I can’t wait to share these amazing essential ōils with you. Hopefully you will discover their amazing benefits for emotional and physical wellbeing as well as offering a natural alternative to so many things. Club packages are be sent out as soon as the yarn is dry, usually during the second week of the month following your order. This gives me enough time to prepare the oils and dye exactly the right amount of yarn. Your money will be deducted on the same date each subsequent month and you can cancel at any time, but please give me as much notice as possible. You will obviously have one month in lieu. You can pay either via PayPal or card. I will send you a link to join a dedicated newsletter, and you may also want to join the ōilyarns club facebook group. Here I will share additional info about the ōils, and behind the scenes stuff about my yarns and how I dye them. I wont put any spoilers on here so your package will always be a mystery, but once I’m sure everyone’s received theirs I may share additional tips and info. (PS please note that voucher codes and sale discounts will not work on any of these options).